Washington, Mo. - The battle has been set and braggin’ rights are up for grabs! Who will win it? The one-day BBQ, invitational showdown will bring competitive BBQ’ers from around the nation back to Washington, Missouri on Saturday, November 16, 2013 for the chance to be crowned the 2013 ICP Team of the Year! People’s Choice Ribs Contest to begin at 1:00 p.m. The Insane Can Posse Braggin’ Rights BBQ Showdown will be held and judged in a KCBS-style format, and will feature White Meat Chicken and Ribs as the two categories. The entire event is open to the public and will also feature a People’s Choice Ribs Contest sponsored by Todd Geisert Farms beginning at 1:00 p.m. Visitors are invited to try each team’s ribs and vote for their favorite. If a visitor votes for the winning team, they will also have a chance to win a “smokin’ good” prize! Owner Tim Scheer emphasizes, “We want to show our appreciation for all of our customers and gratitude for being able to be a part of such a great community.” So, from music to cooking demonstrations and a Gateway Drum Smoker raffle, the event will bring BBQ lovers together for some “Fall Fun” and celebrate their passion for BBQ! The Insane Can Posse (ICP) 2013 Tour may be winding down, but the ICP is still growing strong. The ICP membership extends to anyone who has purchased a locally-made Gateway Drum Smoker. Members are united by their love of barbecue and their bold approach to smoking – “HOT & FAST”! ; nonetheless, they appropriately compete individually on their own Gateway Drum Smoker(s) and are racking up Grand Champion calls around the nation! 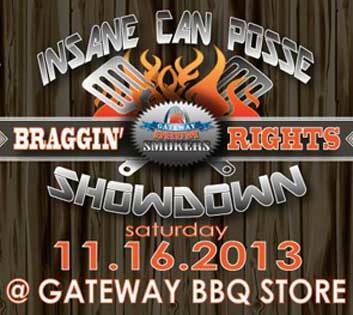 To celebrate the success of the ICP and Gateway Drum Smokers, Gateway BBQ Store couldn’t think of anything more appropriate than hosting a BBQ contest and inviting the community to judge Gateway Drum Smokers for themselves! Widely known as ‘ugly drum smokers’ or ‘UDS’, locally owned Gateway BBQ Store has perfected the UDS and created their very own customized Gateway Drum Smokers. Uniquely engineered for quality performance and ultra-sleek look, Gateway Drum Smokers defy the traditional approach of cooking low and slow, and embrace a new way of barbecuing…HOT & FAST! Slashing cooking times in half, and yet still offering moist & flavorful results is what makes these smokers stand out in the sea of UDS’s. Additionally, what makes the Gateway Drum Smokers rise above the rest is that they are completely customizable! These company-built smokers can be outfitted in any color and team logo, making each unique and reflective of the owner’s personality. Not to mention, they’re proven winners! But don’t just take our word for it! Mark your calendars for Saturday, November 16th and come out for some Good Tunes, Great Times, Family Fun, and; of course, some Finger-Lickin’ BBQ! For more information feel free to visit our website www.gatewaybbqstore.com or the Gateway BBQ Store Facebook Page!